7:30 p.m. to 9:00 p.m. Lesson 9:00 p.m. to 10(?) Open Practice (We can go till later as long as students are still dancing!) $32 for four week months/$40 for five week months or if doing drop ins daily, as opposed to registering for the month, $10 per drop-in. Starting in January 2019, we’ll be hosting NEW Smooth Style Lindy Hop lessons at Slim Fitness in Newark (5437 Central Avenue, Suite #3), with Open Social Dance Practice afterwards! 1. Students want QUALITY dance instruction at AFFORDABLE rates. 2. Students want to ENJOY themselves in an ENERGETIC and FRIENDLY environment while learning. 3. Students want the opportunity to SOCIALIZE in a SAFE and COMFORTABLE environment. 4. 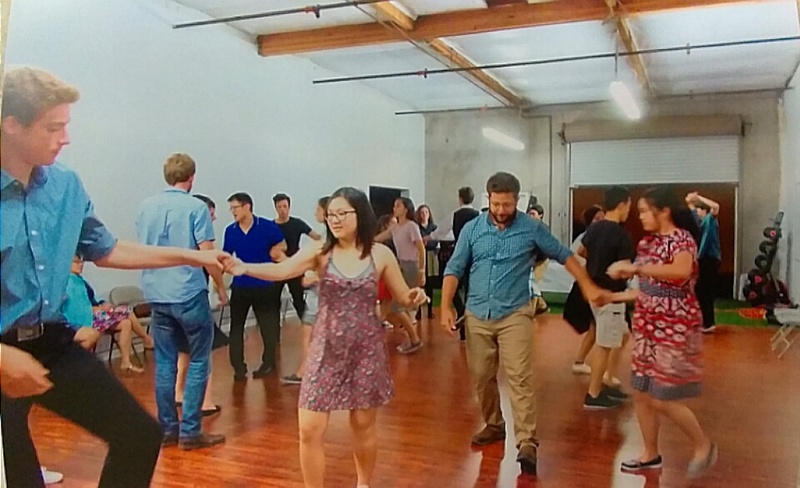 For specifically the Fremont, Newark, and Union City Area, students want an enjoyable swing dance activity that is LOCAL and CONVENIENT. It is with those four approaches that we will conduct our Lindy Hop classes at Slim Fitness. Our classes are unique for the San Francisco Bay Area, in that our swing dance style is the Dean Collins or “Smooth Style” Lindy Hop, which is rarely taught in Northern California, yet easily adaptable when danced with other dancers trained in the more prevalent (for the Bay Area) “Savoy” Lindy Hop or in modern West Coast Swing. And, our style is used in conjunction with energetic and fast-paced traditional rockabilly and jump blues music styles. * As we make the classes grow, we will be opening up more nights, as well as hosting live music events and specialty vintage dance workshops. Payment can also be made at the door, in person, but we request that all fees done at the door be in exact change. Thursday evenings, starting January 3, 2019. $32 for four week months/$40 for five week months or if doing drop ins daily, as opposed to registering for the month, $10 per drop-in.